Inbox by Gmail went live in October of 2014. Immediately there were those who loved the new email interface and those that hated it. I was one of those that immediately found Inbox by Gmail to improve the way I handled email. Yes Inbox by Gmail had, and has, some shortcomings that have been reported by many across various forms of social media. I made an attempt to make a complete list of these missing features and functionalities here. Over the past few months Google has made various improvements and updates to Inbox by Gmail, and after last week's update to the web interface, it got me thinking. What are my three top features in Inbox by Gmail? 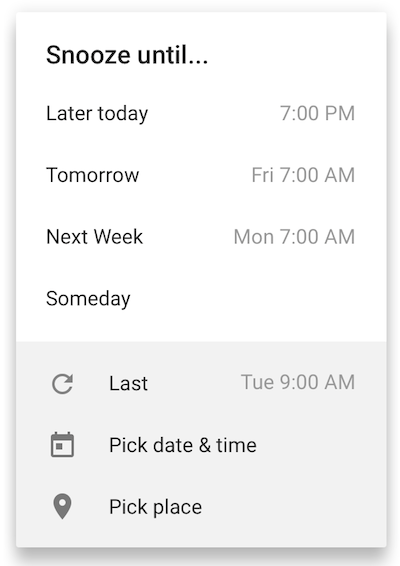 Snooze in Inbox by Gmail gives you multiple options as seen to the left. I mostly use the Pick date & time option so I can plan out the future return of my past emails. Periodically I have used the Pick Place option, such as when I get a notification from the UPS store that mail has arrived. I just Snooze to the UPS store address and next time I am nearby, I get a notification alert and the mail arrival email is back in my Inbox. To be honest, I never use Tomorrow or Next Week as I am not a fan of 7:00 AM emails. In addition, the Someday option doesn't make much sense to me either. I just don't understand the purpose of just placing something in the Snoozed bundle that has no future or plan to come back and notify you. Locating snoozed emails is as simple as opening the Snoozed bundle from the left side menu. For those of you that like options, you can also just search is:snoozed from the inbox. What is cool about the is:snoozed option is that it works in both Inbox and Classic Gmail. Please note, when using that search in Classic Gmail, you won't be able to access the details of the snooze such as timing or place. As a regular user of Google Now and those reminders, I have taken very well to reminders in Inbox by Gmail. Simply put, Reminders are just like snoozing emails, however you enter what you want to be reminded. Interestingly, when snoozing emails, you can also put a reminder to it, so not only will the email return to your inbox, but the information you entered to be reminded of will show as well. I have not really used the reminders in snoozed emails because the email itself is my reminder. What I like most about reminders is how they integrate with Google Now and mobile Google Calendar. The reminders you set in Google Now will appear in Inbox and the reminders in Inbox will show in Google Now. In addition, you can see these reminders on the mobile Google Calendar. You can see my more detailed discussion on Reminders here. You can easily find reminders by opening the Reminder Bundle from the left hand menu. However the list in the Reminders bundle is all encompassing, future and past reminders. 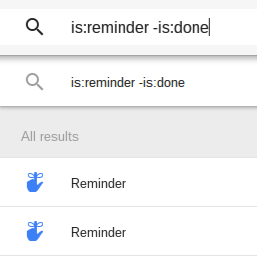 If you want to find reminders that have not past, just search is:reminder -is:done, and you will see all of the reminders that have not been marked done. Highlights are a pretty neat function in Inbox by Gmail. With highlights, you can see pictures, attachments, flight information, package tracking, and more without even opening the email. So if you just need to open these files, no more need to look through each message of a conversation to find it. My favorite part of Highlights is the ability to accept meeting/calendar invites without having to open the email. You will be presented with Yes, Maybe, No. Please note, this currently is not working with ICS attachments. You need to open the attachment to get it into your calendar. I am also a big fan of seeing all of the attachments in an email just underneath the message. It makes finding and opening so much simpler. 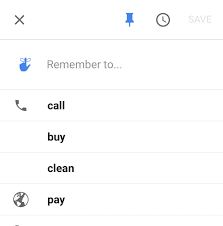 Despite the recent launch of a Contacts menu item, I am still a huge fan of the contact cards in search results in Inbox by Gmail. Just type in a name in the search box and you will see a card with basic contact information. You will be given an option to see more contact details, which brings you to the full contacts page. 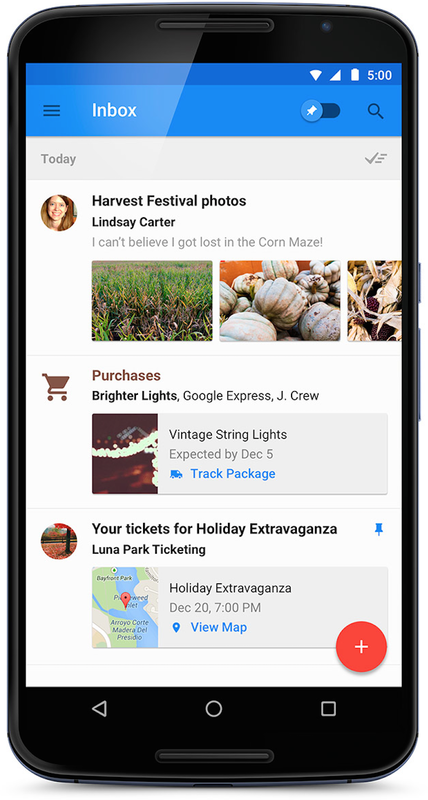 What are your favorite features in +Inbox by Gmail?